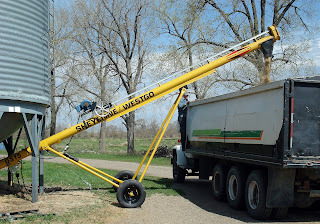 Exciting news -- barley seeding is underway! Above: Seed from the hopper bins is augered into one of our trucks. Can you spot Farmer Fred? 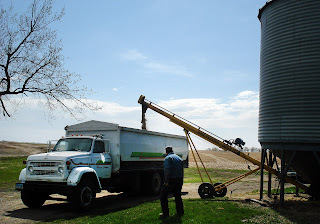 Above: The barley fills the truck box as the bin empties. From here it travels to the field to be put in the drill. 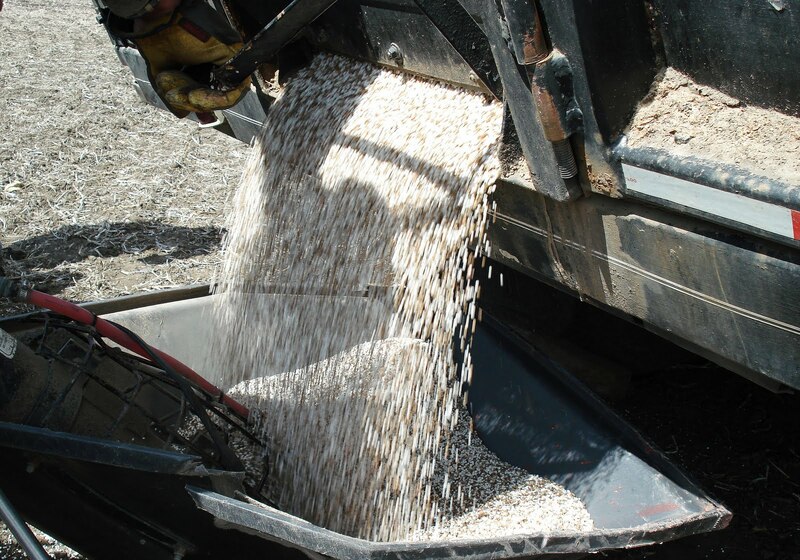 It takes several truckloads of seed to plant the crop. Above: A panoramic view of preparation in the field. Fred is in the center of the image, watching as the fertilizer is being fed into the Concord Drill's auger. 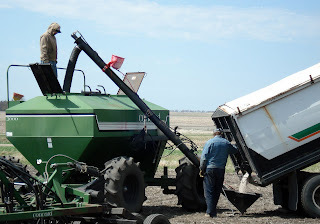 Grandpa Sonny is climbing down from the Case IH 9170 which is pulling our Salford RTS colter machine and seed bed finisher. The Concord Drill is pulled by the Case IH 9280. The 9280 is a 380 horsepower tractor. It has triple tires, meaning there are 12 tires total on the machine. The 9170 is a 335 horsepower tractor with wide dual tires. 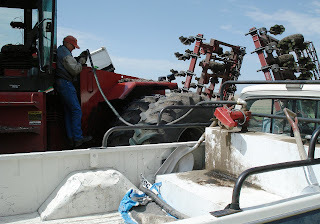 Above: Don is watching the fertilizer as it enters the drill's tank. Fred controls the amount of fertilizer that flows from the truck. Above: We are using a fertilizer blend of phosphorus, nitrogen, and potassium. It is applied with the seed using the Concord Drill. Above: Grandpa Sonny uses the old Dodge pickup's field service tank to refill his tractor's diesel fuel. His job is to prepare the field for the drill. Jim has been picking rocks off the field with our handy-dandy rock picker.